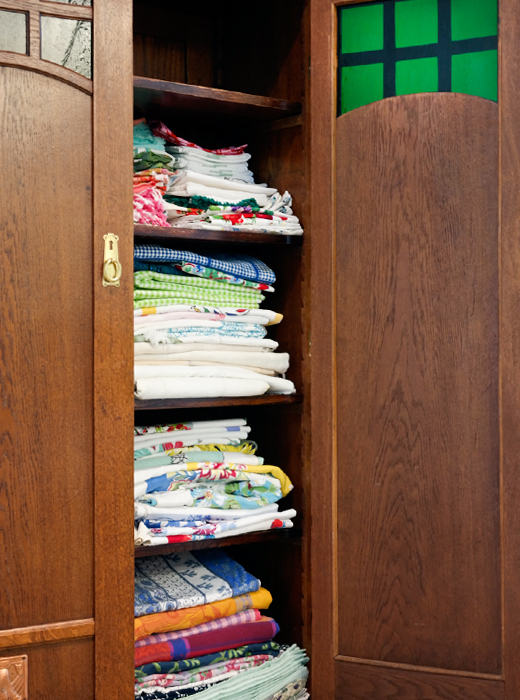 It’s that time of year—the end of February (still two-feet of melting snow outside)—when the spring-cleaning gene kicks in and the urge to clean out everything becomes irresistible. But here’s the truth about my kitchen: I don’t actually live on a farm. But I do live in the woods with a huge garden! And this year, I’m not just spring-cleaning; I’m also giving lots of our old furniture to my “wasband” (a term I learned on my recent trip to California that seems the most fitting description). I’m actually excited to start over and let go of a lot of our things. He really liked Mission-style furniture, which while I enjoyed it, now feels a bit too heavy and dark. I’m ready to lighten up. Still, I can’t help but relive some memories as I empty out the cabinets. One piece in particular is bittersweet to part with: a beautiful mission cabinet with copper and brass details and green glass windows that I used to store my vintage tablecloths. My old friend Cletus Lutz found it for me. He was my “dealer.” He would call and say, “Maria, you have to see this piece—it’s perfect for you.” And even when it wasn’t, I couldn’t help but surrender to him. After all, he did beautiful restoration work and needed the money. But now that Betty has retired, I don’t use the tablecloths as often, since they need to be ironed. And since my mother passed away and my in-laws (or “was-laws”?) are too old to travel, I don’t do the big family entertaining as much either. So the truth is, I can do without the cabinet. I’ll store the tablecloths elsewhere. Besides, now when I look at it, I remember the week that Cletus died of AIDs. And I remember that I couldn’t get to his funeral because we were stuck in Miami as a result of an airline strike—our worst vacation ever. I remember calling from a dingy hotel room, crying on the phone with his partner and telling him I was trapped. Feeling trapped is a horrible thing. And I think it’s at the root of the desire to spring-clean. We’ve been “trapped” all winter in our homes and have a desperate need to clean out and lighten up and be FREE! It’s time to open up the windows, smack the dust out of the carpets, and prepare for the joy of spring. What’s really important isn’t so much the piece of furniture, or even all my glorious tablecloths collected from around the world, but the memories of wonderful meals shared—all cooked, eaten, and enjoyed with love in the actual, real Maria’s “Farm” Country Kitchen! May there be many more meals, recipes, and memories to come! Oh Maria, Maria, Maria! Just the other night I was telling my husband (was-band, a great descriptive word, by the way) that it’s time to get some new, more modern pieces of furniture. I am feeling the need to clean out and donate, and to modernize a bit. I want WHITE, walls, sofas, leather, clean lines, with dashes of colored pieces. I am tired of the dark, heavy traditional wood pieces that we own. It’s beginning to become tiresome. I’m feeling invigorated thinking of spring, and the warm months ahead! I’m raring to go and get things accomplished, especially the décor!! You are correct in saying that parting with certain things can make you sad, but think of it as a new beginning. Let go of those things that once gave you joy, but now have no place in the life of the “new you.” Remember, the best things in life aren’t THINGS, and being ‘willing’ to part with, make you ‘able’ to part with, so one can move one and start the second part of their life unencumbered by the past. Best wishes. I am so sorry about your wasband I like that but starting over can be nice .You can have all the things you love. I do like those tablecloths so colorful. I really enjoy your site one of my favoraites. I will be cleaning things out also already started good luck with everything, looking faward to spring also and trying to do everything organic can be a little overwhelming but I am doing better than most.Thanks for all your information. Ok ! I just want to know where are all Your etsy stores ???? If your all cleaning out there should be plenty of goodies for sale ! XO . Waithing for all your replies . are buying, making the right purchase will be the key to completing your wedding outfit. container with cotton if it is not an air tight container. years. Rather they can go for colourful jewellery made by using beads. A Diamond is a girl’s best friends – this isprobably one of the oldest sayings on Earth.